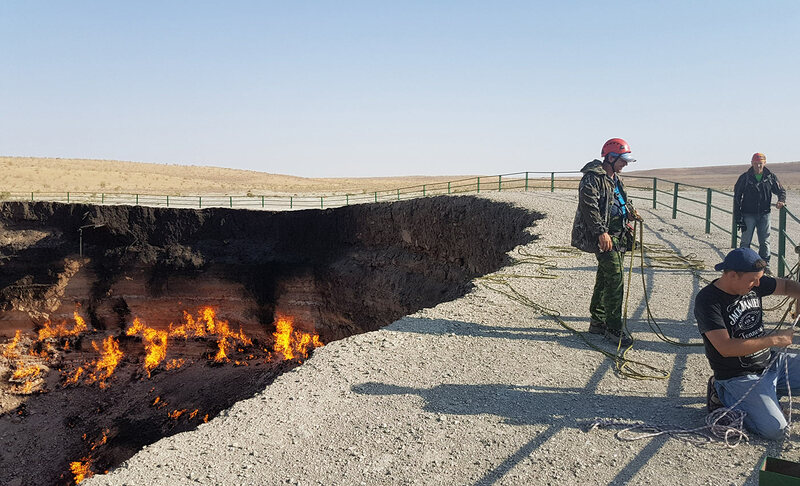 With even less visitors than North Korea, Turkmenistan is one of the most mysterious and unexplored countries in Central Asia. Known for its gas wealth and the bizarre dictatorship of the previous leader Saparmyrat Niyazov, most of the people are still extremely poor. 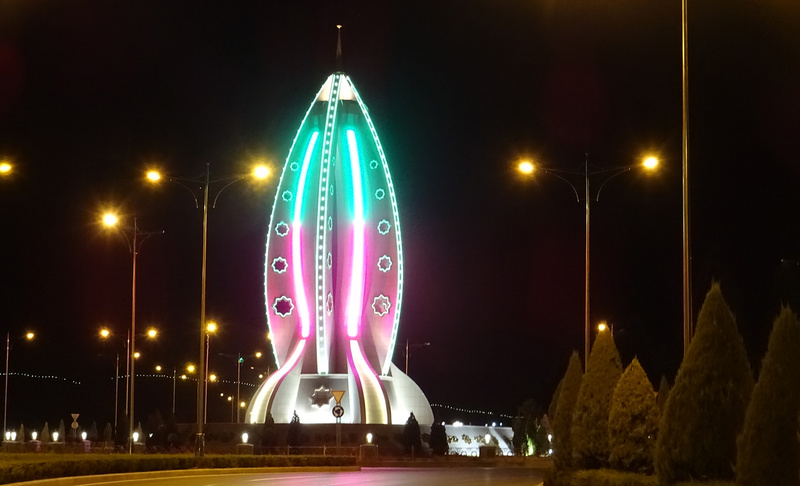 For us Turkmenistan was by far the craziest country to visit. Getting a visa for Turkmenistan is a real challenge. About 50% of applicants are denied without reason. After four weeks of excited waiting we felt like winning the lottery when we got our passports back with a 5-day-Transit-Visa inside. 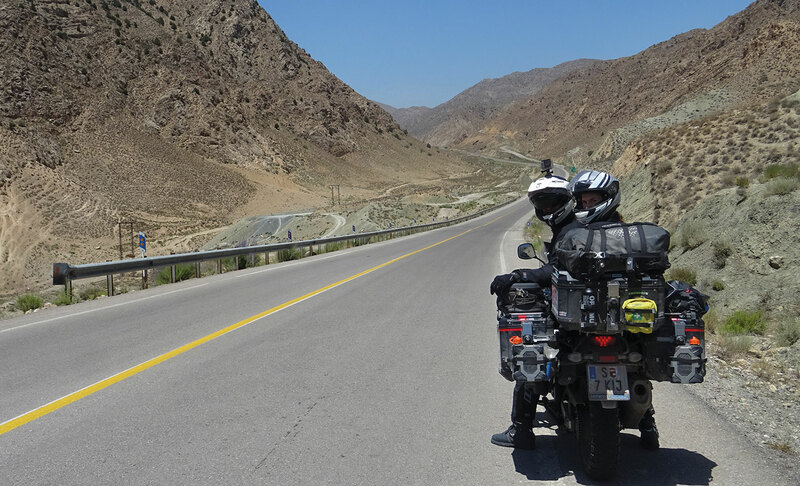 Together with Emmanuel, another motorcyclist from France, we started from Mashhad towards the Turkmen border. New day, new adventure. Meeting Emmanuel early in the morning, together the three of us rode the last 200 kilometres towards Bajgiran, the border point, on perfect road conditions. We had fun riding curve after curve uphill. The temperature dropped to comfortable 25°C. The exit on the Iranian side was easy. Everyone was friendly and helpful. As the gate closed loudly behind us we were unsure of the procedure that laid ahead of us. A bureaucratic nightmare. Inside the first building, we had to show our passports and leave some fingerprints. They wanted to know our exact route and travel plans. We were obliged to strictly follow this route without leaving the main road. The entry procedure took three and a half hours where we had to go from office to office. All in all we paid about 80 Dollars in one of the most corrupt countries in the world. Particularly worth mentioning was the doctor who took Peter`s glasses and told him: “You can`t drive like this. If you give me money, I can let you go”. 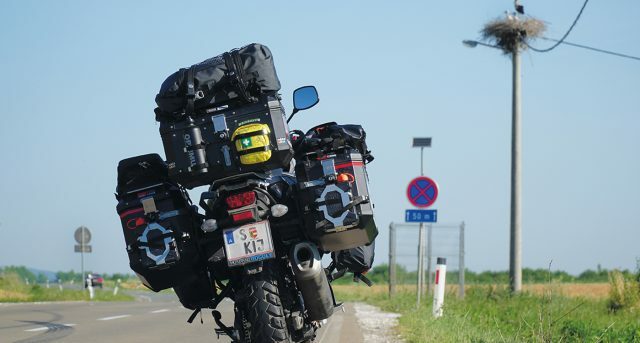 After opening all our panniers and bags we were allowed to go with the limitation of no stopping in the first 30 kilometres. 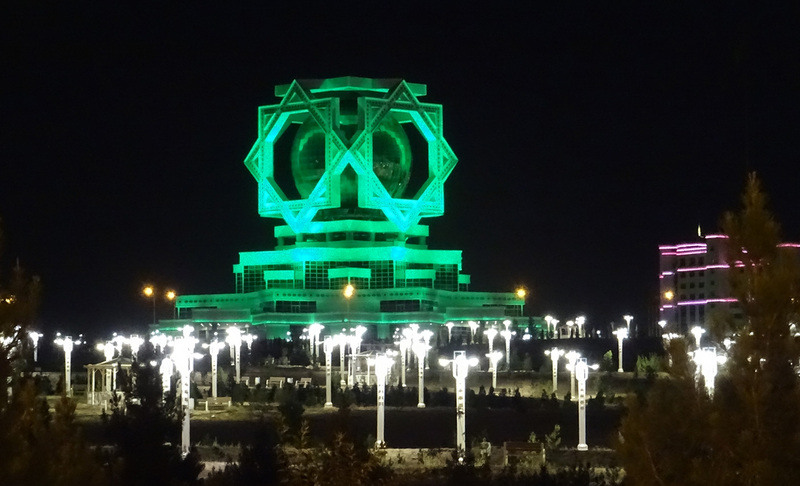 After the 1948 earthquake, Aşgabat was rebuilt in a pompous style to show the world about the glories and accomplishments of the Turkmen. The outcome looked like a set of a science-fiction film. Lonely Planet describes it as a mixture between Las Vegas and Pyongyang. Beside a few white cars with mirrored glasses we saw no one on the streets. Riding around the city in the heat of about 43°C we stopped at a huge shopping mall to cool down and find an affordable place to stay. The pompous interior of the mall also looked like a royal palace. Everything was white with golden ornaments. We spent some time in the huge supermarket to fill up our cookie supplies. On the exit we were surprised to see that a man was already awaiting us. “You are the guy from the customs, nice to see you again”, Emmanuel greeted him friendly. He opened his mouth where we could see his golden teeth and answered in a not so friendly way that we owe him 100 Dollars: “Give it to me immediately or you get in serious trouble”. Before we could even begin to feel intimidated Emmanuel answered him straight away that we wouldn`t give him any money at all and started to go away. Still feeling shocked we followed him asking ourselves how he had found us. 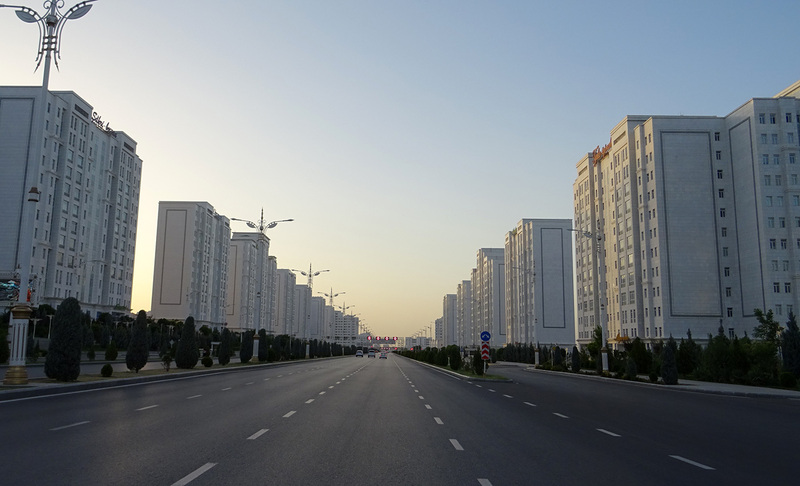 Sightseeing in Aşgabat: Staying in Aşgabat is unbelievably expensive for foreigners. Visitors are only allowed to sleep in special hotels with prices starting at about 100 Dollars per night. We were lucky to meet a German couple in the shopping mall that worked in the embassy in Aşgabat who told us a “cheap” hotel where we paid “only” about 100 Dollar per night for the double room. In the evening we found a nice place to eat near the hotel where we happily drank our first beer since entering Iran. Claudia also enjoyed the freedom of not having to cover her hair in public anymore. 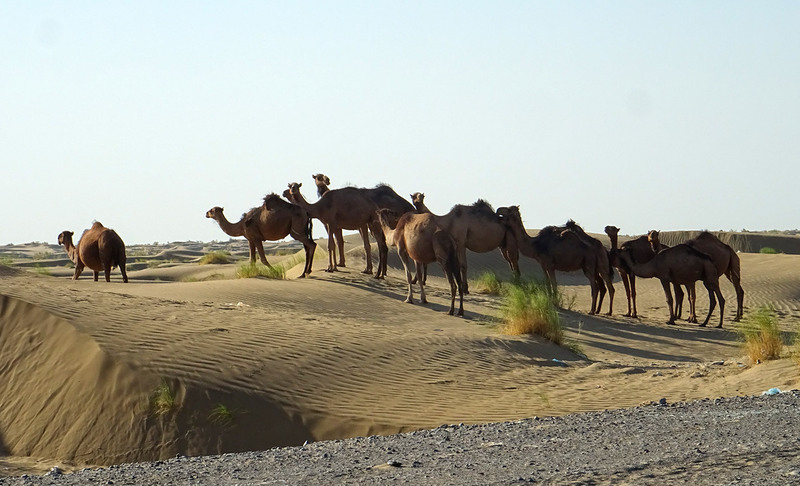 Coming from Iran to Turkmenistan, one of the most restrictive countries in the world, nearly felt like freedom to us. Aşgabat at night was even stranger than during daytime because many buildings are illuminated in different colours and nobody, except people cleaning the streets and policemen, was there to watch them. We saw the famous Wedding Palace changing colours from green to gold to red. 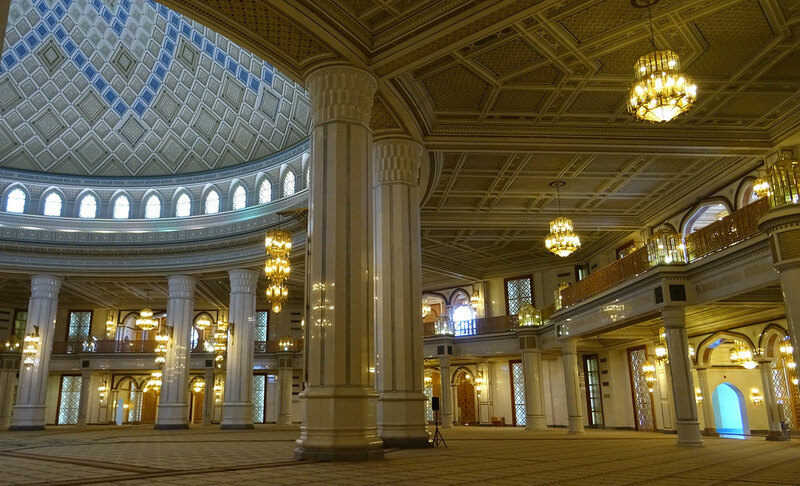 The building has six rooms for registration of marriage, seven banquet rooms, 36 shops, two cafes and a hotel. 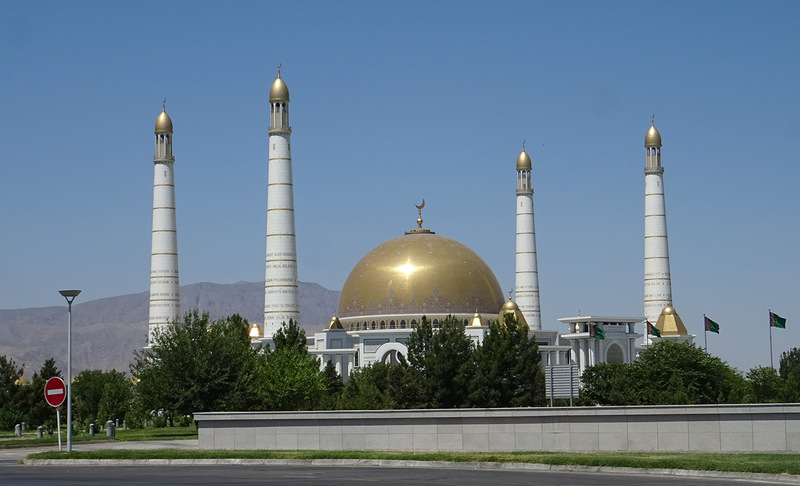 On the next morning we wanted to visit the famous Gypjak Mosque, the largest mosque of Central Asia. From afar we could see the golden dome and the four minarets rise into the sky. We didn`t have to look long for a parking spot because there was a huge underground parking garage that was completely empty. Around the mosque there are numerous fountains with crystal clear water glittering in the sun making it look like an oasis in the desert. Stepping inside felt like heaven when the temperature dropped from over 40°C to about 25°C. Standing on the soft hand-made carpet we admired the huge praying hall with white marble columns and a richly painted celestial blue dome. 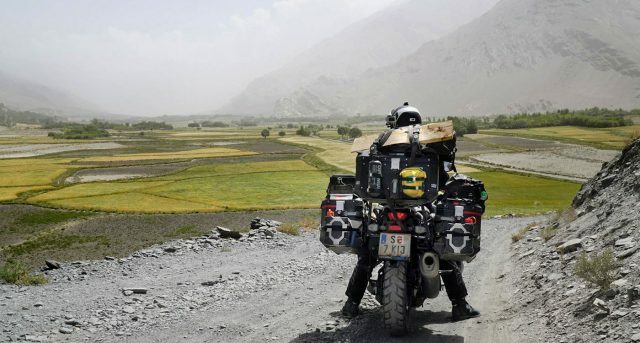 Leaving Aşgabat behind the scenery soon changed to the endless landscapes of the Karakum desert. The road passed through dry fields that soon after changed to sand. While stopping at a gas station we saw another small motorcycle. The driver was on the phone facing away so we couldn`t see his face. Thinking nothing of it we went on and stopped at a small shop next to the road to buy some cold coke when we saw the same bike standing a few meters next to us just waiting. Sure that we were being followed we went on but stopped after the road got downhill when the biker suddenly reappeared. He stopped looking surprised at us. 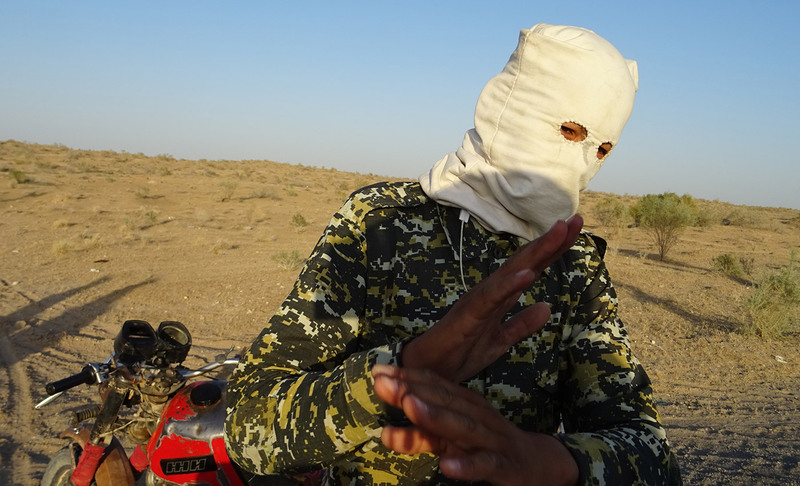 He was wearing a military jacket but his face was covered. 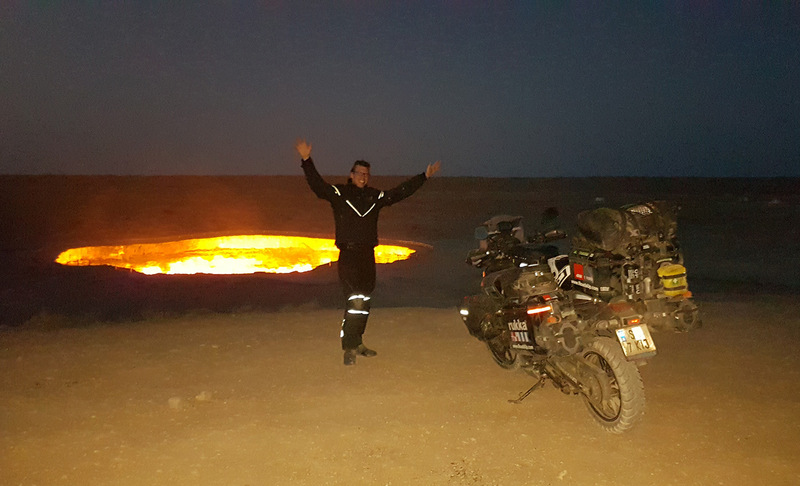 Leaving the main road we had to ride through the sand for the last 7 kilometres and soon we reached the last part to the gas crater, the so-called Door to Hell. 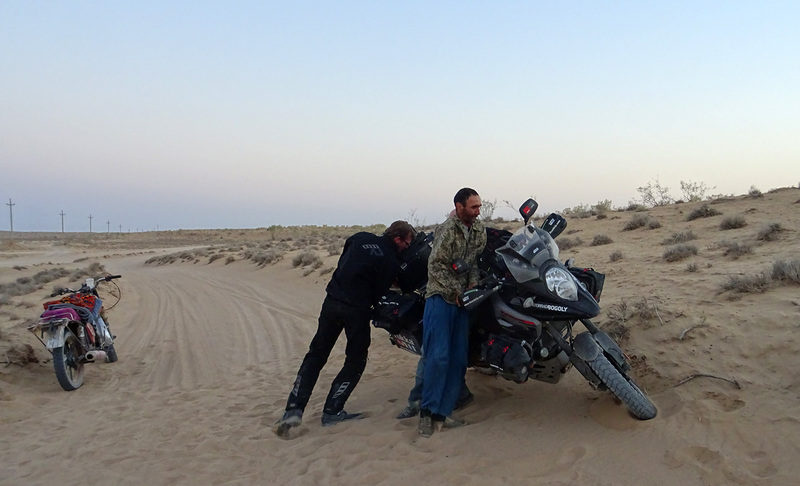 The sun was going down slowly as we tried to move the heavy bike through the deep sand. Emmanuel with his light Husqvarna was riding in front of us having fun while we tried our best to keep on going. Always accelerate, don`t go slow! Peter did as he was told and went a few meters before the heavy bike turned to the left and fell on the side. The three of us managed to lift the heavy bike up again. 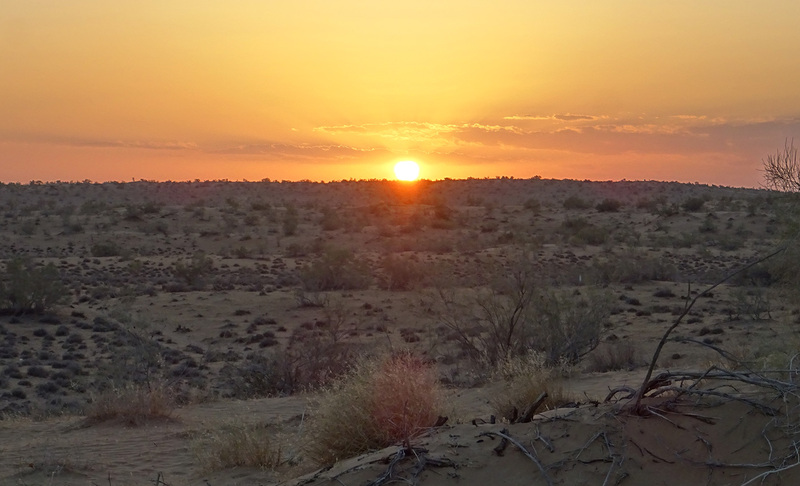 Meanwhile the sun was slowly going down in fantastic orange colours. The road didn`t get better. It just parted to many different sandy paths. 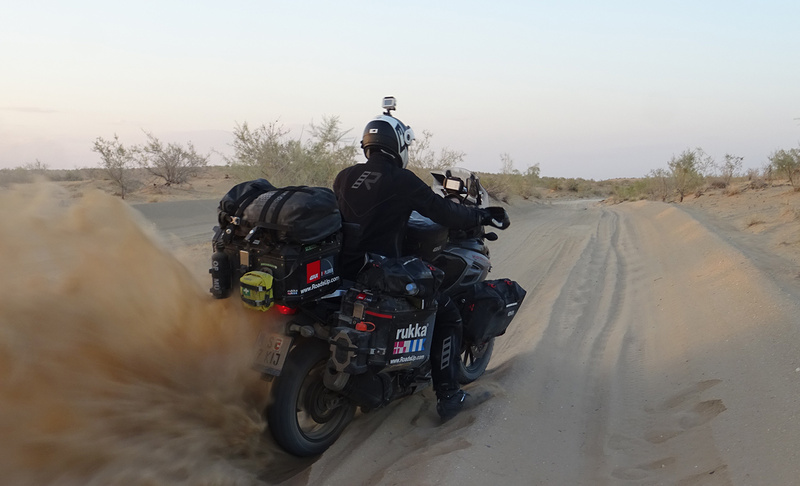 As the bike fell down again on the last kilometres, we saw a cloud of dust in the distance. It was a small bike moving in our direction. At first we thought that it would be our follower. Maybe he would help us. But it turned out to be a friendly local who stopped his bike and helped us immediately. On the already dark road a car with a local tourist group on the way to the gas crater appeared and stopped at our sight. 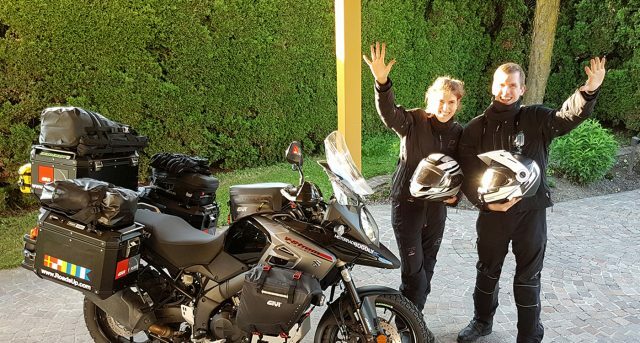 Deciding that Peter would be better off riding the bike alone, Claudia got into the car and joined the group for the last kilometres. The atmosphere in the car was great. Everyone was having a good time. 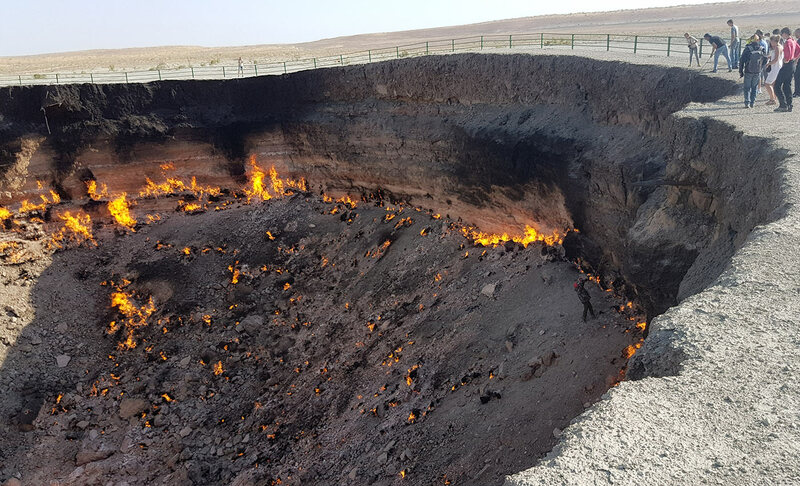 Seeing the gas crater for the first time was truly impressive. Soon Emmanuel, Peter and the local also reached the Door to Hell. We all were really excited that we finally made it. Near the burning hole there was a yurt where we celebrated our success. For a while we just sat there and looked at the since more than 40 years continuously burning flames. Later in the night we met a group of locals at the gas crater. Standing a few meters next to it was already quite warm so we were surprised to hear that one of them planned to climb into the hole on the next day. Let`s see, we thought and went to sleep in our sleeping bags outside the yurt dreaming of the burning flames. The next day didn`t start well because Emmanuel found out that some of his money was missing. When he asked the people from the yurt, they suddenly didn`t understand the English language anymore. We learned for the future to lock away our money securely even if we just go away for a short time. In the distance we could already see people standing around the burning crater. 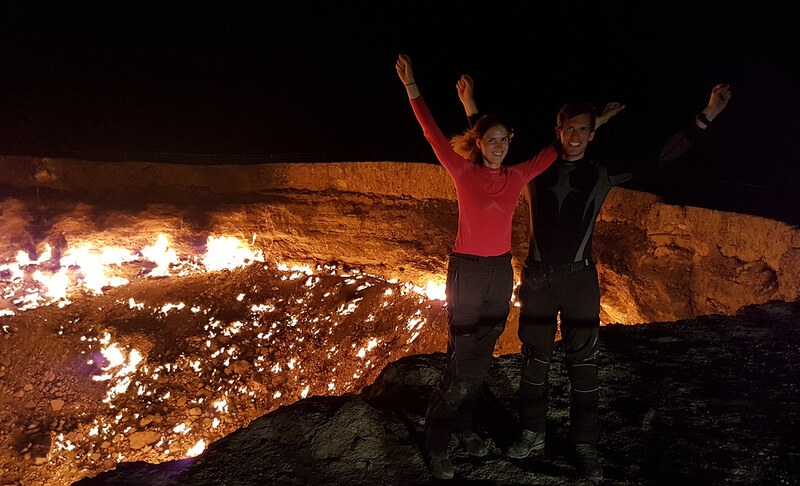 When we arrived we saw the group from the day before really preparing for climbing down into the flames without any kind of professional equipment. After they had secured the rope on their car the man started going down into the heat. 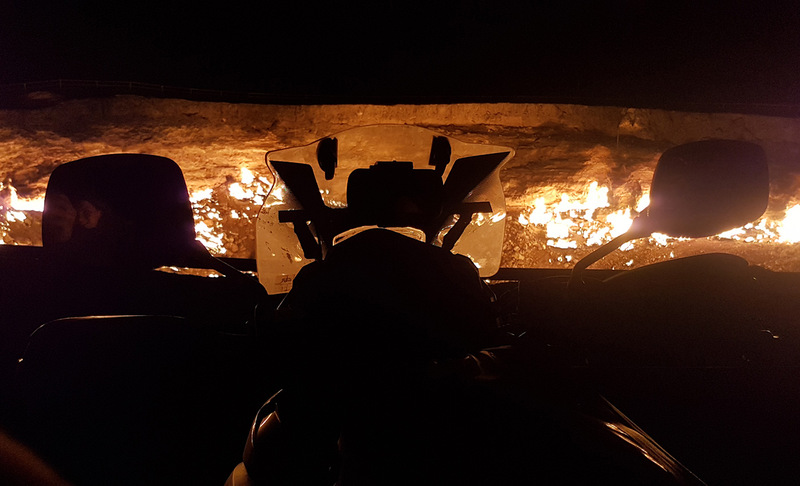 As he was descending further he was standing amidst the flames. The heat had to be unbearable and as soon as he was fully down the others started pulling him up again. The three of us watched fascinated as he came up again looking exhausted and in pain. The others immediately put some spray on his hands that should help against the burns. 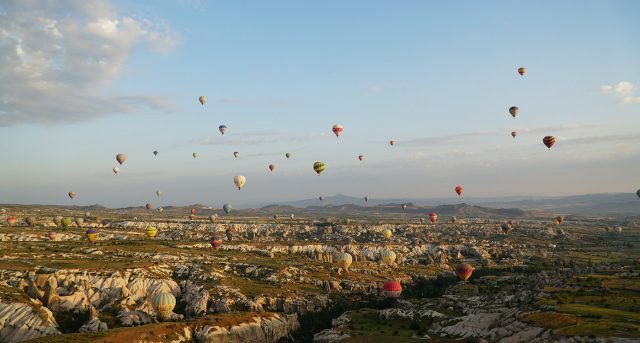 We learned that for Turkmen citizen there are not many options for travelling or exploring different countries. 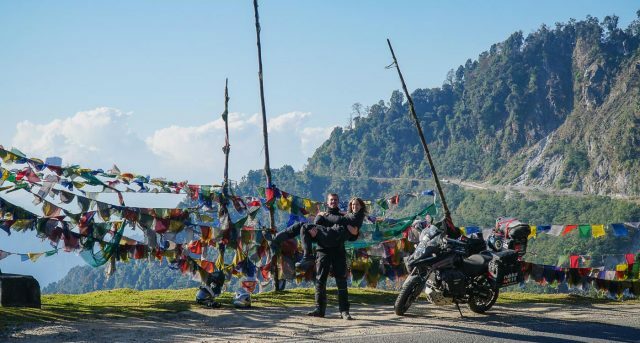 In their free time they love to do some crazy things in their own country. The way back to the main road was much easier because Claudia was sitting in the back of the small local`s bike and Peter was riding behind them. Going behind a local in this area is the best idea because they know exactly which route to take. 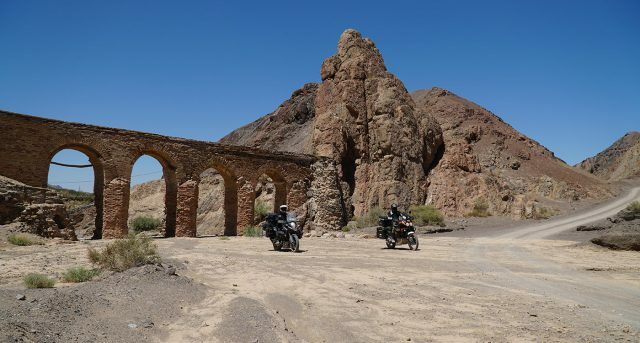 We managed to reach the main road without falling and continued our way through the country. We were riding for hours on the completely straight road. It was getting hotter every minute but there was just sand on both sides of the road. 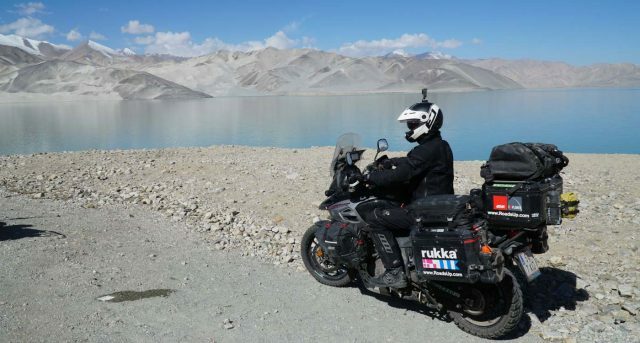 Sitting in the shade of our motorcycle next to our hot engine was still better than the heat of the sun. After hours of riding we finally reached a gas station. There we found a cool room with mattresses. After having some food we fell asleep immediately. When applying for the visa we had to tell the exact route we planned to take. Emmanuel had to exit in Kunya-Urgench whereas our exit point was Daşoguz. At that place we had to say goodbye to Emmanuel. It was great riding with him. 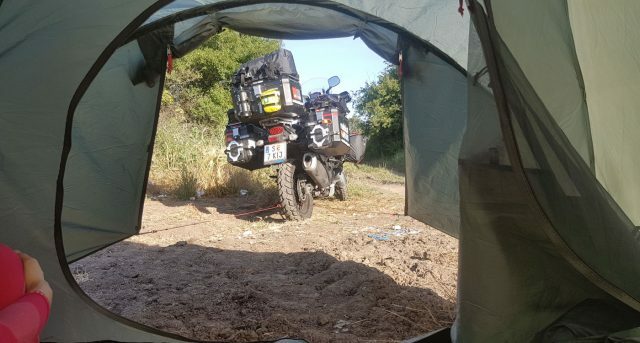 We spent the last night in Turkmenistan in Daşoguz where we met Didier Martin, another motorcyclist from France, who just came back from riding in Afghanistan. We listened attentively to his stories. 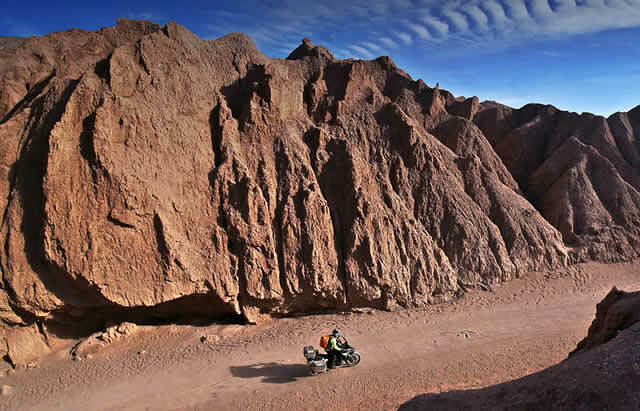 He also rode his bike twice through Africa and had already travelled most parts of the world. The next morning at breakfast we were the only ones sitting there except for a local guy sitting a few tables away. He kept looking at us strangely and we had again that feeling of being watched. On our way to the border we also noticed the same car following us around everywhere we went. 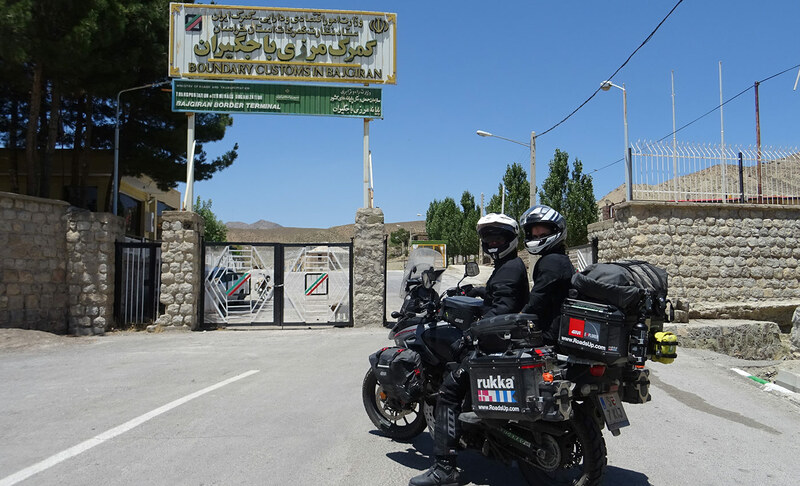 The border crossing to Uzbekistan was quicker than expected. 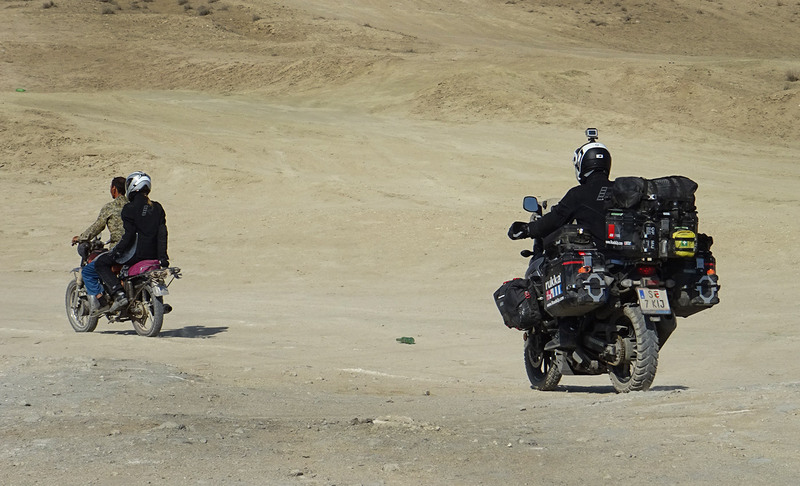 Although riding in Turkmenistan was an amazing experience, we didn`t like the feeling of being watched all the time. It would have been interesting to find out more about the country and spend more time with locals.